If you spend a lot of time on your feet during the workday, you must have a comfortable pair of work boots. 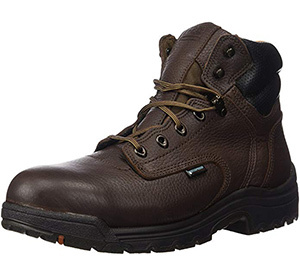 The Timberland Pro Men’s 26078 Titan 6 Waterproof Work Boot is a full-grain leather boot with a flexible rubber outsole. It’s made to keep your feet dry and provide you with sure footing on all surface conditions. This boot breaks in quickly and meets nearly every industry protective footwear guideline. Here is a complete review of the Timberland Pro Men’s 26078 Titan 6. Your review includes an overview of the boot, including some features you may find appealing for your work boot needs. The Timberland Pro Men’s 26078 Titan 6 has a curved-shape tongue with extra padding on the collar for optimal comfort. Inside the boot are polyurethane footbeds, which are contoured to fit snugly against the base of your foot. When you lace up the Timberland Titan 6, you boot will feel like it becomes an extension of your foot. This boot is extremely sturdy, comfortable and waterproof. It ties securely to your foot, using a series of four metal eyelets across the arch of your foot. Next, there is one loop-style eyelet. To secure the laces, the boot finishes with a pair of boot hooks. The boot hooks help to secure your laces tightly, plus make it fast and easy to get your boots off when the workday is over. The heel has an extra layer of thickness for added cushioning and shock absorption. Finally, here some more of the top features of the Pro Men’s Titan 6 work boot. The TiTAN® alloy safety toe not only meets ATSM standards, but it’s lightweight and mold fitted for comfort. There is a mesh spacer in the inner lining that helps to wick moisture away from your feet and reduces foot odor. This helps keep your feet cool and comfortable on those long hot workdays. Timberland uses premium full-grain leather. It is soft and the boot uses cement construction to give you a quicker break-in time for your new boots. Timberland stands behind their comfort guarantee. During the first 30 days that you wear your new Timberland boots, if you are not satisfied with the comfort, return them for a full refund. A nylon shaft supports the inside of the boot, so once you lace them up they feel secure and stay tight. When your boot stays tightly laced to your foot, you can rely on the waterproof membrane to keep your feet dry in the wettest conditions. The Timberland Pro Men’s 26078 Titan 6 Waterproof Work Boot keeps your feet dry in as deep as four inches of standing water. The waterproof leather outside keeps the water out, but this boot also has a mesh liner that keeps your feet dry and comfortable. It contains an anti-microbial quality to wick moisture away from your feet. This helps all but eliminate foot odor problems, keeping your feet comfortably dry all day long. Heavy construction jobs like factory workers, machinery operators, or chemical plant workers. Timber workers or other types of jobs that are exposed to frequently wet conditions. Auto repair specialists, HVAC technicians, electricians, and inventory stock workers will appreciate the outstanding flexibility of this boot. Jobs that require a lot of walking such as land surveyors. Workers who do not require a reinforced safety toe, or a waterproof boot. This boot is not the best choice for those individuals who need a full-length boot. The outsole is reinforced, but not sewn. A boot with a sturdier outsole may better serve jobs that have to travel over rough and rocky terrain. The outsole is also attached using cement for excellent flexibility, but since it doesn’t have reinforced stitching, it is not the best choice for workers who need to use their boot to apply force. Ditch diggers and dock hands may benefit from a more secure outsole attachment. If you’re not familiar with selecting the ideal work boot, here are a few suggestions for you to consider. Naturally, a comfortable fit is always a priority, but there are other things you should think about. Always research any possible work or job-related requirements your footwear may have to meet. The OHSA footwear standards are an excellent place to start. Consider all the different types of conditions you’ll be exposed to, such as chemicals, wet surfaces, or bitterly cold temperatures. Calculate approximately how much walking you may do in a day. This will be important when determining how much flexibility you need from your work boot. Finally, if you haven’t had both the length and width of your foot determined, do this before beginning looking for that ideal pair of work boots. Finally, this concludes our review of the Timberland Pro Men’s 26078 Titan 6 Waterproof Work Boot. Hopefully, you’ll find the information and listing of features useful. If you’ve owned a pair of the Timberland Titan 6 work boots, tell us about your experience. In addition, if you think we missed any points in the review, let us hear about those as well.